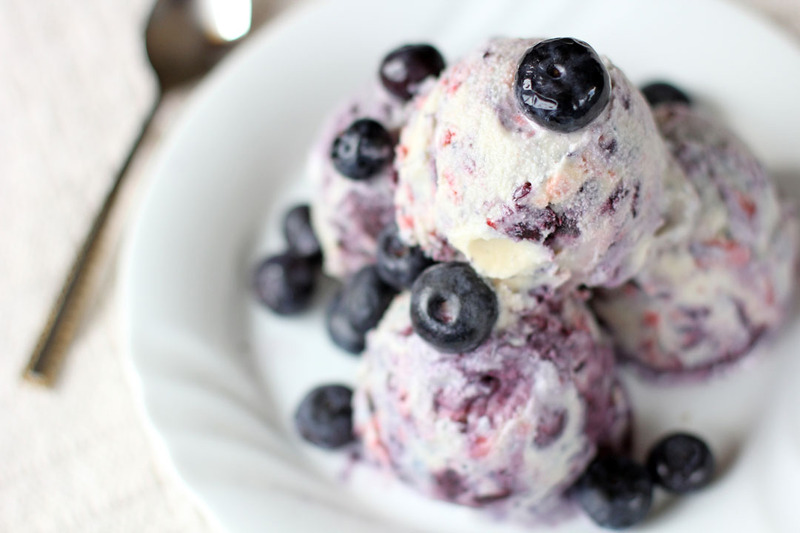 Last summer I bought a lot of berries as its cheap and they can be frozen and used in a lot of things like baked items, smoothies and ice cream flavours like this post, the Mixed Berries Swirl Ice Cream. If you haven’t been following my posts this is not the first ice cream I made and in fact I had posted some already like the pistachio and some unusual ones like the cheese and purple yam though they all proved to be popular I decided to make something normal today anyways it’s a good excuse to use all that stocked up berries and eat ice cream at the same time. Place in a heat proof container, let it cool down then place in the fridge for at least four hours. In a small saucepan combine together blueberries, 2 tbsp brown sugar, juice from ½ lemon and ½ tsp cornstarch, cook in low heat while crushing berries. Once all berries are mashed and thick remove from heat then set it aside to cool down. In another small saucepan combine together raspberries and strawberries, 2 tbsp brown sugar, juice from ½ lemon and ½ tsp cornstarch, cook in low heat while crushing berries. Once all berries are mashed and thick remove from heat then set it aside to cool down. Prepare your ice cream maker and pour the cream mixture, churn according to ice cream manufacturer’s instruction. Mine took 30-35 minutes. You can now lightly fold in the two different berry mixture then freeze for at least 6 hours. Always delicious and always so right for the season. I love utilizing fresh seasonal berries when the shops fade fast and far and recapturing that great flavour later on when it’s all but disappeared from the shelves. So refreshing and so satisfying! As much as I love rich chocolate ice creams, berry ice cream is always seems lighter and the bright flavors make me long for summer. Isn’t it great to have good berries in the freezer? I drug out some blackberries for a cobbler last week, which was great for what was still a wintery evening here. That ice cream looks delicious. I so regret not having an ice cream maker when I see a lovely bowl of ice cream like yours. Oh, I love any treat made with mixed berries! This ice cream looks delicious and is such a pretty color, or should I say “colors”. What a great use of those frozen berries. I’m working on cleaning out my freezer now as well, getting ready for next season. Hopefully, the fruits will be as plentiful as they were last year. Hope you’re having a great weekend. Looks delicious! I just purchased an ice cream maker the other day and I can’t wait to try it out! Bookmarked! it’s nice to know that it’s so easy to make an ice cream at home after all. 🙂 thanks.